I'm sure it's terrific, but the Getting Started instructions need to be re-written for Newbies like me. 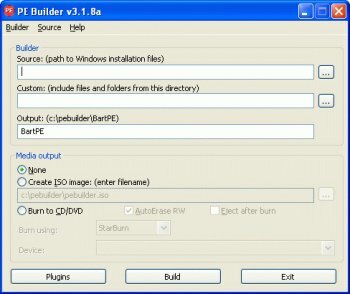 After inserting my original Windows XP Installation CD in the drive, and then clicking 'Yes' to start the search... PE Builder then starts its search. From here, at no time is there a message saying remove my installation disc and replace it with a blank CD in the drive for BartPE to burn to. Guys, this software is the core of recovery. It saved me nearly £100 in computer repair costs. Simply booted up and sorted everything out. I have used Bartpe since Bart gave free from the first edition to now and its the best program that I have used and I am still using and adding programs to it even now whilst looking for plugins I saw this forum and had to join to say how great this program is. This is an awesome program, who would think you could boot windows xp from a cd, and then be able to run customized programs, that execute directly from the cd. This can be an extremely usefull program, and it's actually not as complicated as it seems. You can even connect to the internet with firefox, it's just crazy, got to love it. This is a must have program for people in the IT business, great for recovering personal files, moving files, or cleaning nasty spyware or viruses. 5 out of 5 in my opinion. Op onderstaande link kan je een voorbeeld iso downloaden, voor deze die het niet zien zitten er zelf eentje te maken. Enkel de FreeWare en ShareWare versies zijn geinstalleerd. Great program. Should be in everybody's bag of tricks. THis program is absolutely a MUST HAVE for any administrator. You can remove viruses and adware from outside the normal os, burn cd's, repair partitions... the possibilities go on and one. For the person that asked, yes, Nero greater than 5.5 will work. I got 6 to work on mine. With all teh plugins that are available out there and the tools with which to create plugins yourself, no two BartPE environments should be the same (unless you just use what it comes with). My own personal version is up to 5 now, since new plugins come out all the time. There are not enough good things to say about this one. Very useful tool, and free is a very good price. I have had this working for me for years now and it has been extremely helpful, especially accessing NTFS partitions when the main OS goes wonky. BartPE has always been a great program. Of course not when they started off, but the software has matured a lot! I use it for unlocking PCs using the ERD commander pluggin with virus scanner and network support. It's great! There are many more features of the program that can be integrated from other developers, I would recommend this program to any computer administrator who responds to daily customer problems! Beautiful tool! The McAfee command line scanner, Stinger, and Ad-Aware plug-ins, work like charms. Short of a catastrophic h/disk failure, files can easily be rescued with Bart's PE if required. Does anyone know if a Nero version greater than 5.5 will work for a plug-in? Hi, I noticed that nobody roasted that guy which gave a rating of one for Bart's PE. Yes, suppose that you really cannot comment on that. Perhaps you should read the write up on the software "For administrators only". Bart PE (Tech 182) is so comprehensive that myself and my work colleagues were blown away for at least an hour of exploring its functionality... and we never even scratched the surface. If you like exploring/fixing/breaking/etc this is it. There are alternative OS's which boot off one CD, however they do not give anywhere near as much functionality (in the Windows realm). Before I layed my eyes upon BartPE I was looking at Knoppix as a one disc solution (Linux). Truthfully though, the learning curve is steep (for Win users). compare these solutions with the current one, and you will soon realise why this one is a 5!